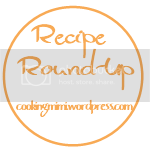 This week I’m doing something a little differently than normal with the recipe round up. Instead of doing the normal random sort of recipes I am sharing a complete meal idea. I have a meat main dish, a starch side, a vegetable side and a dessert. Oh my! These all look fantastic! Thank you for sharing! I’m coming to your house for dinner! Yum! Thanks for including our green beans! Everything is making me hungry.